Can you be flexible and eye catching at the same time? 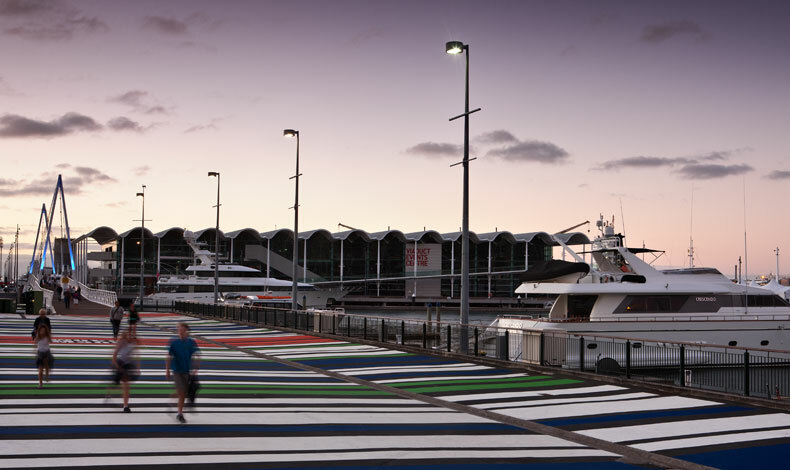 Waterfront Auckland commissioned Boffa Miskell to design a five year, temporary route-marking installation to emphasise the new pedestrian route that now crosses open space previously used for car parking. Broad bands of boldly coloured surfacing mark out the new route, which leads from Quay Street through the Eastern Viaduct onto Te Wero Island. From there, the recently completed Wynyard Crossing pedestrian/cycle lifting bridge provides direct access to Karanga Plaza adjoining the newly opened Viaduct Events centre. Movable tree planters containing semi-mature pohutukawa trees and incorporating seating structures line the route and provide a physical separation to adjacent areas of car parking.